Paul Jackson’s portrait of ever-popular Garry McDonald represents an actor in full flight and also his battle with depression and involvement with Beyond Blue, the national organisation working to address issues related to depression. Jackson depicts the actor and two of his famous characters: Arthur Beare from the TV series Mother and son and Norman Gunston. “The shadow is like a physical presence in the painting representing the depression that dogs Garry,” says Jackson. “He has his left ear turned to it as if listening to an inner voice but is in front of it and therefore overcoming it. Garry’s gaze is full of questions, which he shares with the viewer: what is the meaning of life and art and what has he achieved?” The string that pulls on the Gunston doll is a controlling force which underlines the development of Garry’s characters to the present day and runs through his solar plexus, which is the exact vanishing point for the portrait: an intentional construct. Born in Auckland, New Zealand in 1950, Jackson came to Australia in 1976 and lives in Sydney. He has been exhibiting regularly since 1969 in New Zealand and Australia in both solo and group exhibitions. 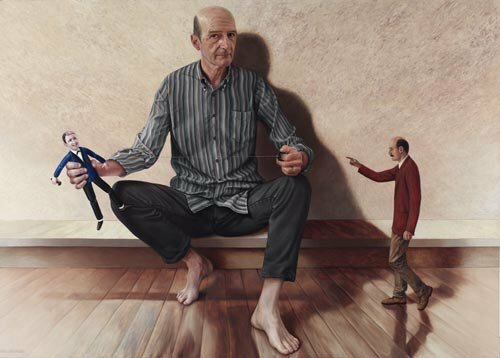 This is his fifth time as an Archibald finalist. His work is represented in public gallery collections in New Zealand and in private collections in Australia, New Zealand, the USA and the UK.